February 1 2015. The 2015 USATF Masters Long Distance Running Circuit will have its kickoff event in 6 days with the USA Masters Cross Country Championships in Boulder Colorado. On Saturday September 7th, teams and individuals will gather from across the country to contest this championship. The Men will run an 8 km course while the Women contest the championship over a 6 km course. The Masters event is held on the Flatirons Golf Course the morning of the 7th. In the afternoon the Men’s and Women’s Open races are held on the same course to choose the teams for the World Championships in Guiyang China in March. The Masters Women's race is at 8:15 followed by the Men’s race at 9:00 a.m. Over 250 runners, 17 Men’s teams and 10 Women’s teams are entered, a larger field than last year. A closer look at the team rivalries will be posted later this week. In this post I examine the individual races. Who will get off to the good early start for 2015?! Overall. Last year the overall Masters winner was Greg Mitchell of McMinnville OR and he is back to defend his title, running for the Bowerman Track Club. The three runners who were in hot pursuit are also back, Rusty Snow of Goleta CA, Ahrlin Baumann, of Portland OR and Simon Gutierrez of Colorado Springs CO.
Mitchell was able to break away between 4 and 6 kilometers and then hold that gap all the way to the finish. How will it unfold this year? Will there be new challengers? Late update: Jacques Sallberg, Olympic caliber steeplechaser and former member of Team Running USA, is now a Masters athlete and is in the entry list. At the 2013 USA Club Cross Country Championships, when still an open class athlete, he beat Masters #1, Ulrich Steidl by almost a minute. He should offer a real challenge to Mitchell and the rest of the crew. M40-44. Typically the winner of the overall race is also the winner of the M40-44 category and that was the case last year. The podium for the overall and M40 group was the same—Greg Mitchell, Rusty Snow, and Ahrlin Baumann, although Simon Gutierrez, from the M45-49 group, came within a hair of breaking the M40 hegemony in the overall standings. M45-49. Gutierrez is back to defend and the 2nd place runner, Paul Thompson, of Peekskill NY is back to renew the rivalry. Last year Thompson was able to hang with Gutierrez and the rest of the lead pack for the first 2 kilometers but then Gutierrez pulled away steadily. But 2015 is a new year. More importantly for the age group, Rusty Snow has moved into the 45-49 group so becomes the favorite for this age group crown. M50-54. In 2014 it was Andrew Ames, of Boulder CO and Mike Blackmore of Eugene OR contending for the top spot. Last year Ames had a small lead at the 2 km mark but then built that up over the next 4 km before Blackmore closed the gap a bit over the last loop. Blackmore and Ames are back this year and are joined by contenders from points east and west who were not here last year. Spyros Barres, of Mystic CT who was the age group national champion in 2014 at both the Half Marathon and Marathon will test his endurance over this shorter course. He is joined in pursuit by Eric Stuber of Lansing MI, the age group national champion at the 1 mile (road), the 5 kilometer cross country and the 12K. 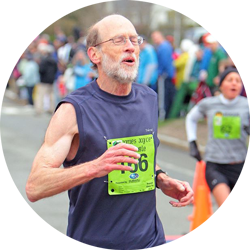 Francis Burdett of the Greater Springfield Harriers in Massachusetts, is now 50 and entered; last year he finished 2nd in the USATF 15K national championship and 3rd at the 12K championship. That kind of speed should find greater reward in this older age group. And Pete Magill, the celebrated Cal Coast runner, can never be counted out. That should add a little regional rivalry to spark up the M50 group. M55-59. Brian Kelley of Lincoln NE and Don Spale of Lakewood CO went head-to-head last year for the win. But the runner from the suburb of the Mile High City was not able to catch the plainsman. Kelley built a 20 second lead over the first half of the race and held it to the end. But the wild card in 2015 will be Brian Pilcher of Ross CA. Injured for most of last year, the 2013 Masters Runner of the Year did not compete in the first half of 2014 and was still not at the top of his game by the end of the year—but he was getting close. He will likely give Kelley and Spale, who are both back, all they can handle. M60-64. Doug Bell of the Boulder Road Running company had a dominating performance last year, winning the age group by over three minutes. It might have been interesting to see if Tom McCormack from Tennessee, who broke the 5K road record for this age group last year, would have come to contend for this 8K cross country title, but that duel will have to wait for another time. Only so many trips across the country can be arranged and McCormack is committed to Brea CA for the 8K championship. Perhaps Bell will consider a trip to Southern California later in the month? In any case, Bell took the crown by nearly 3 minutes, and is the favorite again this year. But the race for 2nd and 3rd was tight. Tim McMullen and Bruce Wilkins of Genesee Valley outduelled John Tarkowski of Ann Arbor. It was very close through the first 4 kilometers but then McMullen and Wilkins were able to open up a gap that held through to the finish. Bell, Wilkins, and Tarkowski are all back so look for another great battle for the second two spots on the podium. M65-69. Last year, this age group was a battleground between Ann Arbor Track Club’s Lloyd Hansen and Terry McCluskey and Boulder Road Runners John Roeske and Richard Katz. Roeske got off to an 11 second lead over Hansen and Katz in the first 2 km loop, as McCluskey got off to a slow start. Roeske maintained the lead through the half but then Hansen surged through the third loop to take a 15 second lead which he built up over the last loop to take the title. McCluskey closed strong coming back from a 19 second deficit to finish only 6 seconds back of Katz who finished the same margin behind Roeske, very tight indeed. Hansen, Roeske and Katz are back this year to do battle but not McCluskey. But there is a strong, new entrant in Ignacio Jimenez of the Santa Barbara Track Club, who has moved up from the 60-64 age group. He did not run this race last year but he did run the USATF 8K championship in Brea CA last year. He finished 2nd in a very strong M60-64 field that included Peter Mullin, Dale Campbell, and Tom Bernhard. He will be a formidable competitor. M70-74. In 2014 Larry Brooks, of Santa Barbara CA claimed a 2 and a half minute victory over Tom Lemire of Boulder CO.
Lemire has entered but not Brooks. That leaves it open for Jan Frisby, who last ran here in 2013 but has been battling injury ever since. If his foot does not betray him, Frisby is certainly the favorite with a 20:20 5K at the USA National Championship in Syracuse and a 1:08 15K on a tough course and a hot day in Tulsa in October. And he was the 2013 winner in the 65-69 division of the USA Cross Country championship. M75-79. John Brennand of Santa Barbara CA won this race last year by a country mile. As he has not entered, the age group appears to be wide open. If past form holds, it should be quite a race between David Turner, Sr. of the Atlanta Track Club and Thom Weddle of the Ann Arbor Track Club..
M80-84. Mike Fenerty and Verne Carlson of Boulder and Longmont CO respectively had quite a duel last year. They were neck and neck to the half way spot. Shortly after that, Fenerty started to pull away, opening up an 8 second gap by the end of the 3rd loop, and over a half minute by the end. Both have entered this year so we can look forward to another barn burner of a race this year. Overall. In 2014 Nuta Olaru of Longmont CO, Melody Fairchild and Colleen DeReuck, both of Boulder CO, dueled for the win. All four were even at the end of the first loop, but Olaru opened up a 3 second lead by the end of the 2nd two km loop over Fairchild, with DeReuck another two seconds back. Each of the gaps widened slightly over the last loop, despite the best efforts of the trailing runners. Melody Fairchild, in hot pursuit of Olaru, finished 2nd overall at the 2014 USA Masters XC Championship at Boulder CO. In the end Olaru had a victory by 5 seconds over Fairchild with DeReuck further back in 3rd. Then there was a gap back to Joanna Zeiger and Maureen Wrenn, both of Boulder. Even with Olaru and Fairchild at the end of the first lap, Zeiger held a 27 second lead over Wrenn after the first 4 km but Wrenn closed strongly to reduce the gap to 2 seconds. DeReuck, Zeiger and Wrenn are entered but Olaru and Fairchild will not be back, leaving DeReuck as the favorite. W40-44. Typically the overall podium and that for the Women’s 40-44 age group are identical. But not so this year as Colleen DeReuck, at age 49, landed the third overall podium spot. No one was surprised, however, as DeReuck holds multiple national age group records. So the podium for the women’s 40-44 group was: Olaru, Fairchild, and Zeiger. It looks like a real battle between Zeiger and Wrenn is in the cards. W45-49. As one might expect, the race for the age group win was not close. DeReuck finished nearly two minutes ahead of the second place runner. But the race for second and third was quite tight! Cindy Abrami of Santa Barbara CA went out very fast and was only a few seconds behind Wrenn 5th place overall, at the end of the first loop, with Susan Nuzum of Boulder CO almost ten seconds back and with Noelle Green of Erie CO seven seconds back of her. But whether Abrami had gone out too fast, the terrain proved too difficult, or she encountered an injury, she faded badly after the first loop. By the end of the 2nd loop, Nuzum had passed Abrami and Green was closing in. In the end it was DeReuck, Nuzum, and Green on the podium in that order. DeReuck has moved up to the W50 group for 2015 and neither Nuzum, Green, nor Abrami are entered. So it looks like a fresh podium. Tania Fischer, of The Jane’s Elite team, who took the women’s 45-49 title at the 2014 National Club Cross Country in Bethlehem PA, should be the favorite. Her teammate, Kirsten Leech, took 3rd at Club Cross and will definitely be a factor in Boulder. Certainly Kathleen Cushing-Murray, fresh off a 19:22 5K, will also be making a run for the podium. W50-54. This 2014 race unfolded in a very orderly way with Sheila Geere, of Colorado Springs CO, establishing an 8 second lead over Laura Bruess, of Boulder CO and built on it each lap to win the age group in dominant fashion. And Bruess, in turn, had a 14 second lead over Janet Rooney, of Louisville CO, at the end of the first lap and also built on that throughout the race. So it was Geere, Bruess and Rooney on the podium. Bruess and Rooney are entered but not Geere. The big news for this group is that DeReuck has turned 50, now runs in this age group and is entered. If she is anywhere near her usual game, everyone had better watch out! W55-59. Ellen Hart of Denver CO took this age group title handily but it was a very close east-west battle for 2nd and 3rd. Hart had a 10 second lead over Martha Buttner of Boulder CO and was 20 seconds ahead of Catherine Utzschneider, of Chestnut Hill MA, by the end of the first loop. Hart added to her lead throughout the race. But not so with Buttner and Utzshneider where Buttner’s early advantage eventually faded away. By the end of 4 km, Buttner had built her early lead up to 16 seconds, but Utzschneider knew how to close out a race as she roared by in the last 2K loop to claim 2nd spot on the podium, five seconds ahead of Buttner. What a contest! For 2015, Hart and Buttner are back but Utzschneider will, apparently, not make the trip across the country again this year. Catriona Dowling, of the Boulder Striders finished 12 seconds behind Buttner last year so should be ready to challenge. Delcia Litt, of Athletics Boulder might also be a factor. W60-64. Kathy Martin, the 2014 Cross Country Harrier of the Year (and also in eight previous years), dominated a strong field in this race last year, defeating Edie Stevenson of Boulder CO by nearly 3 minutes. Kathy Martin, 2014 Cross Country Harrier of the Year, maintaining her focus as she heads toward one of the hazards on the Flatirons XC course. Martin, as usual, took 1st place in the W60 division at the 2014 USA Masters XC Championships in Boulder CO.
Stevenson, typically on the podium at any national championship, defeated the 3rd place finisher, Amy Lease, of Boulder CO by nearly 2 minutes. Martin is back for 2015 but Stevenson has, in the interim, moved up to the 65-69 age group and is entered there. Lease has not entered so there will be some turnover on the podium, despite Martin’s likely dominance up front. W65-69. Like the next two age groups, this age group, in 2014 was a local affair. Jean Nistico and Rima Lurie, both of Boulder, finished 1-2, two minutes apart. Two minutes later Patricia Tolleson of Westminster CO claimed the final spot on the podium. Nistico and Tolleson are entered for 2015; Lurie not so. But, as noted above, Stevenson has moved up to this age group and is entered. If Stevenson can run anywhere near her 2014 time, the race for the age group win will not be close. W70-74. In this division, Betty Valent sped to a nearly 3 minute victory over C. Gail Hunter, both of Boulder CO. Eight and a half minutes later, Elisabeth Kandel of Lafayette CO finished to claim the 3rd spot on the podium. All three are on the 2015 entry list. We will see if the fitness levels are similar this year. W75-79. This was Libby James’s event. The celebrated four-time age group Runner of the Year, from Fort Collins CO, took the title by more than ten minutes. And she’s back aiming to do it all over again.